Giant thermometer; hyperspectral imaging; neutron diffraction. 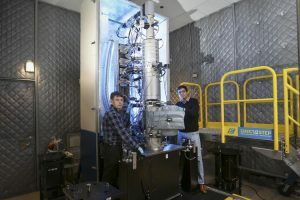 The Department of Energy’s Oak Ridge National Laboratory has devised a new way to take the temperature of a material at the nanoscale—the organization has developed a giant thermometer. The technology, dubbed electron energy gain spectroscopy, enables researchers to take the temperature of a material from an area at about a billionth of a meter wide. 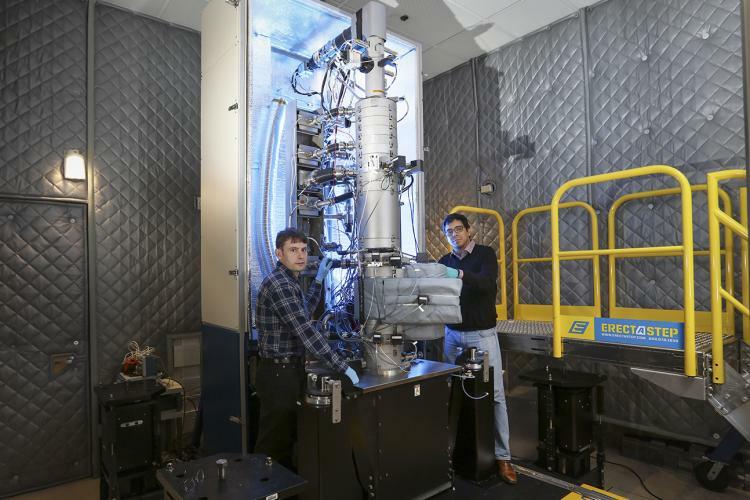 Developed by Nion, the thermometer consists of a 13-foot-tall instrument, which is called HERMES (High Energy Resolution Monochromated Electron energy-loss spectroscopy-Scanning transmission electron microscope.) Applications include materials, semiconductors and other technologies. There are other types of thermometers in the market. Competitive nanoscale thermometers require calibration. In contrast, HERMES gives direct measurements across a wide range of temperatures. Rice University has developed a way to look at plasmonic nanoparticles using snapshot hyperspectral imaging (SHI). SHI, which is used in astronomy, enables researchers to look at nanoparticles and see how they react. Applications include photocatalysis, photovoltaics and electrochemistry. Plasmonic nanoparticles are tiny crystals. They absorb and react with light. And they can be tuned for a range of applications. SHI is a method for capturing images in a set time period. This instrument has detector arrays with a high number of pixels. At Rice, the SHI system consists of a microscope, beam splitter, a transmission grating and two CMOS cameras. First, the image of a microscope is split into two parts by a beam splitter. The first image is focused onto one camera. Then, the image reflected and diffracted by the grating. This generated spectral image is refocused to the second camera. Benjamin Hoener, a graduate student, added: “When you make a sample of nanoparticles, you don’t get particles with exactly the same size and shape. You wind up with particles that have defect sites, slightly different shapes and crystal structures that make them absorb light and molecules on their surfaces a little differently. “Because they’re also sensitive to the local environment, we can track when electrochemical reactions occur on a single particle, at what (electrical) potential those reactions occur and compare them to see what makes this process happen faster on one particle than another,” Hoener said. A group has made a new breakthrough by observing electron spin arrangements in sample materials using neutron diffraction. The group includes the National Institute for Materials Science (NIMS), the Japan Atomic Energy Agency (JAEA) and the Japan Proton Accelerator Research Complex (J-PARC). Neutron diffraction is a metrology tool, which directly observes spin arrangements in devices or materials. Using a wavelength of about 0.1nm to 0.3nm, the technology also determines the atomic and magnetic structure of a material. The technology from NIMS and others have some advantages over conventional methods, which measure neutrons scattered by the spins at various angles. This, in turn, blocks the scattered neutrons, according to researchers. In contrast, the new method from the NIMS-led research group measures the linear transmission of neutrons. This is done via a sample material from a neutron beam source. Neutron diffractometry has some drawbacks, however. It is challenging to measure neutrons scattered at extreme conditions. The NIMS-led research team made a new breakthrough. The group hypothesized that spin arrangements in materials could be characterized. This is done by measuring the transmitted neutrons.